I have recently read out of order a later book in this series and enjoyed it so I decided to read some of the earlier books. Payment in Blood is the second in the series. I enjoyed seeing the development in Lynley and his sidekick/partner Havers. This was a classic isolated country manor mystery, with Lynley being called in due to political reasons that are explored and exposed in the book. The references to Christine Keeler and John Profumo were interesting and added to setting by connecting to real life events. Having read a later book in the series first, I can see a big evolution in style for the better from this one. 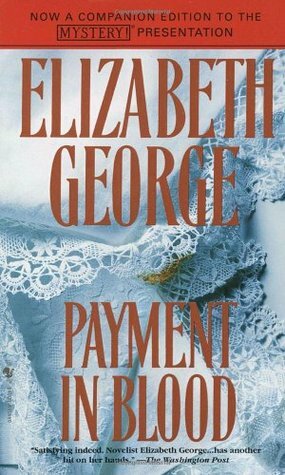 Payment in Blood reads like a outsider’s version of class strife in Britain. The presentation of a very divided society with an entitled and pampered class of titled families was unrealistic from my experience. In fact, I kept having to remind myself that this was not a historical book because the attitudes and depictions of the homelife struck me as pre WWI. Overall, the character development saved the book for me, the rest was just okay.